Like many of you, I suspect, I was a lucky recipient of DexEU’s recent reply to a popular petition demanding a referendum on the final Brexit deal. I signed the petition mainly to register my protest at how the entire process is being handled, and less because I am adamant that there should be a second referendum — I would prefer our politicians to see sense before we ever reach this stage. I wanted to make the point that the way Brexit is being conducted is undermining our democracy and completely ignoring the wishes of those who wanted to remain, and even those who simply wanted a soft Brexit. And the reply certainly lived up to my expectations of our current government — arrogant, blind, haughty, misinformed and with distinct authoritarian tendencies. What follows is a look at the text all signatories of the petition were sent — my favourite bits and my thoughts on this patronising and anger-inducing piece of garbage. Really? Thanks for reminding me. I temporarily forgot about that. “The UK Government is clear that it is now its duty to implement the will of the people and so there will be no second referendum. Will you please just stop already with the “will of the people” nonsense?! Firstly, who are the people? Because last time I checked, an awful lot of the people voted to remain, and many others did not vote. Even more people were disenfranchised, especially overseas Britons, casting doubt on the validity of the entire exercise and certainly on the notion that this was the will of the “people.” And if you are referring to that slender majority of people who did vote, well even in that case, the “will of the people” is not an immutable, fixed thing. It changes over time. That’s the entire point of a democracy. Or, dear Tories, should we have a permanent Labour government with Tony Blair at the helm because that was the “will of the people” in 1997? You actually just said that a couple sentences ago, but thanks again for reminding me. This is meaningless twaddle. That is because it was a choice between two things. The vote to remain was the second-largest democratic mandate in UK political history. But as has been made clear, that mandate does not matter to this government, the 48% are irrelevant. Yet more twaddle. In our wonderfully archaic electoral system, we essentially have a choice between two parties. 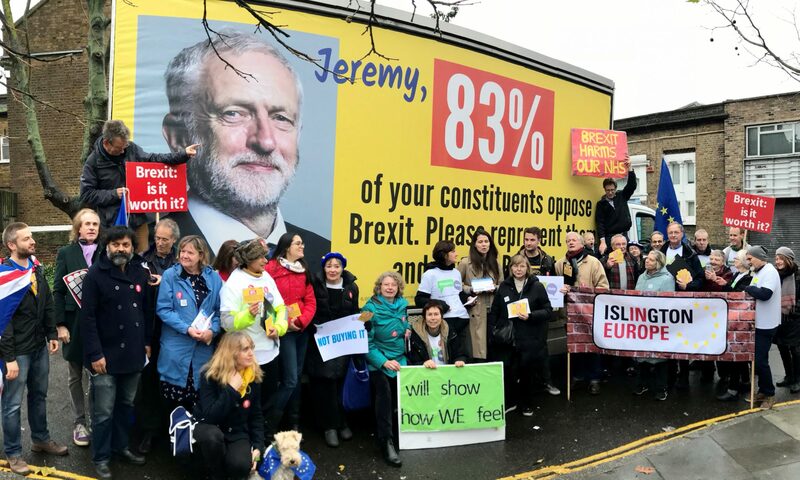 It so happens that they are both led by anti-Europeans, and many pro-Europeans will have felt forced to vote Labour to keep the Tories from winning in their constituencies. It in no way follows that 85% of people support Brexit, this line of reasoning from DexEU is an obvious logical fallacy. Wait. A. Minute. Is the UK still a democracy? Erm, I think so. So I can bloody well attempt to do anything I like. I can attempt to remain in the EU. I can attempt to rejoin it through the back door — or the front door, for that matter — and I can attempt to lobby for a second referendum. How dare you tell me what I can and cannot attempt to do? As long as my actions are legal, you have no right to stop me attempting anything. And I promise, should you be so foolish as to take us out of the EU, especially without a deal, we will keep attempting to rejoin the EU over the long haul. And that is my right. You can label me “unpatriotic” as much as you like, but you will not take this right away from me. Did the country vote to leave the EU? I had just forgotten that so thanks for reminding me. As parliamentarians, it is your duty to second guess the referendum result. Blindly accepting it and pushing the decision through without any real debate and any proper planning, regardless of the devastating consequences, is a dereliction of this duty. A balanced approach? You have got to be kidding. Serious talk of a no-deal Brexit is not a balanced approach. You have never taken the concerns of Remainers on board, you have relentlessly made us feel like second-class citizens and traitors of the country. You have referred to our neighbours, allies and partners as “the enemy.” Do not insult my intelligence by pretending you are taking a balanced approach. Did the people vote to leave the EU? You are right to remind me, because I am very stupid indeed and had forgotten this fact since the last time you mentioned it. The truly frightening thing about this particular section is that it says that no matter what happens, no matter how bad this Brexit thing gets, no matter how devastating the consequences for Britain, we will carry on with it because “the people voted to leave.” We simply no longer have the right to change our minds or ask for a change in direction. That sounds an awful lot like authoritarianism to me. “Both Houses of Parliament will have the opportunity to vote on the final agreement reached with the EU before it is concluded. This will be a meaningful vote which will give MPs the choice to either accept the final agreement or leave the EU with no agreement. Argh! I had again forgotten that the people had voted to leave the EU. Thanks again for reminding me DexEU! You are such a good friend for making sure I don’t forget this important thing. I mean, I am liable to forget the event that this entire omnishambolic mess is based on. A country that is stronger? The World Bank has predicted that a no-deal Brexit will see UK trade in goods plummet by 50% and by a staggering 62% in services. In this world, how on earth will the UK be stronger? We are already weaker as a result of Brexit, and it hasn’t even happened yet. A country that is fairer? Being a member of the EU guaranteed our basic rights to things such as paid holiday and maternity leave. It ensured we upheld basic environmental standards. It did not stop the British government from adopting policies that would have helped to reduce inequalities: a failure of domestic politics has made our society unfair. And leaving the EU will only make this worse, as we inevitably end up having to dismantle our system of rights and standards to be able to compete economically. A country that is more united? I can barely dignify this with a response. We are more divided than ever. Theresa May could have come to power promising to heal the divides caused by the referendum, but every day her government has been in office, their rhetoric has only increased these divides. Hate crimes have soared since the referendum, in the permissive environment that it created. And don’t get me started on the issue of the Irish border. More outward-looking? Sorry while I step out for a moment to have a good laugh. In my lifetime, we have never been more inward-looking. Major global issues are being debated and resolved without our presence. We no longer speak for Europe on the UN Security Council, as that role has now fallen to France. We have no bandwidth to conduct creative foreign policy because every bit of resource is consumed by mitigating the fallout from Brexit. Foreign talent is leaving the island in droves. Jobs are being relocated to the continent. More outward-looking?! DexEU, your words are nothing but empty promises and platitudes. Please stop lying to me. Stop patronising me. Stop telling me to shut up and put up. Because I won’t, because you are ruining my country and I won’t sit idly by and let it happen.